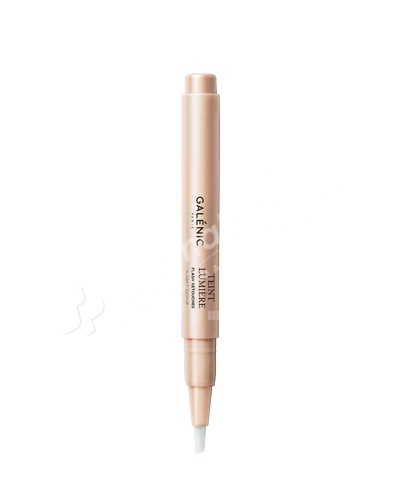 Galénic Teint Lumière Flash Touch-Up Beautifier Ivory 2ml with extremely fine texture, on a brush form, has been created to reduce marks of tiredness, to highlight shade areas. The main component of its formula, the Amazonian Uncaria with antioxidant properties is here combined to other active ingredients such as: the betaine and a moisturising glycol, mineral pigments with an oil protection, for the light and the fusion with the skin, but also absorbing powders for a velvety peach skin effect. Results: the skin recovers its beauty and its radiance, it is surrounded by a powdered sensation. Apply with small touches on skin with the tip of the brush or with your fingertips. Can be used during the day for touch-ups. Click to activate the brush. Indication : To reduce marks of tiredness, to highlight shade areas. Aqua (Water), Cyclopentasiloxane, Titanium Dioxide (CI 77891), Methyl Methacrylate Crosspolymer, Propylene Glycol, Isononyl Isononanoate, Betaine, Sodium Chloride, Peg/PPG-18/18 Dimethicone, 1-2 Hexanediol, Peg-10 Dimethicone, Disodium Edta, Disteardimonium Hectorite, Ethyl Hexyl glycerin, Fragrance (Parfum), Iron Oxides (CI 77492), (CI 77491), (CI 77499), Mica, Polyglyceryl-4, Isostearate, SD Alcohol-39 C (Alcohol Denat), Sodium Stearoyl Glutamate, Sorbitan Sesquioleate, Tocopherol, Tocopheryl Acetate, Triethoxycaprylsilane, Uncaria Tomentosa Extract.